A very early morning, obviously. It’s 3:15am and I have to leave for work in about a half hour, but I woke up extra early for some reason today. I figured I should blog now because I’ve got the time. I seem to love to keep myself extremely busy. Okay, I seem to love to do everything to the extreme. I don’t have a happy medium apparently! Haha. Today is going to be a nice 15.5 hour day…Work, workouts, class, meetings and a demo this evening. I’ve found a new way to incorporate my two favorite things in the world………. This is me at the gym jamming out while I work. Yes, I am a nerd. No, I don’t have kids. You may or may not know that I am a music fanatic to say the least. I went to recording school and have played piano and guitar for the better part of my life. Although you would THINK this would mean I’m good at those instruments, well, I play for 6 months, then take a year off and have done this for about 8 years. I can still rock out though! 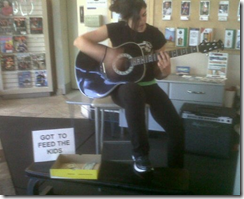 Anyways, bringing my guitar to work has been the highlight of my shift! Playing music at the gym=two passions combined. Success! Another reason why I’m not a fan of the corporate gyms….couldn’t do this there! This prep has been relatively easy mentally. I’m making progress, it’s just a matter of if there is enough time. I am now just under 6 weeks until my competition and although I’m leaning out, I’m just not sure I’ll be ready in time. Sure, I could be ready enough to get on stage, but for a national show, I need to be looking 110%!!! My coach and I talked and we are going to decide July 7th whether I do USA’s or wait another month and head to Texas for Jr. USA’s. Kind of frustrating as seeing that I have invested a lot into this particular show, but it’s not out of sight yet and I’m pushing it HARD!! We’ll see what happens in these next 2.5 weeks!